The rising occurrence of uterine fibroids among women is the primary stimulant of the growth of the U.S. market for uterine fibroids treatment. The Society of Interventional Radiology states that around 30% to 40% of women aged 35 and above suffer from uterine fibroids. Moreover, the advent of minimally invasive and effective alternatives to open surgeries is working in favor of the market. The presence of favorable reimbursement policies is also encouraging patients to undergo uterine fibroids treatment. Medicare & Medicaid services – a national social insurance program in the U.S. – covers reimbursement policies and payments for ambulatory surgical centers and hospitals. Furthermore, technological advancements and frequent product innovations coupled with an increase in regulatory approvals of novel products are stoking the growth of the market. However, the presence of substitutes such as drug therapy to uterine fibroid treatment procedures is hampering the growth of the market. Moreover, stringent regulations pertaining to treatment devices delay their launch, which in turn adversely affects the growth of the market. With all these factors put together, the U.S. market for uterine fibroid treatment is poised to reach a valuation of US$273.6 mn by the end of 2024 from US$217.6 mn in 2016, rising at a CAGR of 2.9% between 2016 and 2024. Based on type of procedure, the hysterectomy segment will continue to represent the lion’s share in the U.S. market for uterine fibroids treatment until 2024. The segment can be further classified into laparoscopic hysterectomy, abdominal hysterectomy, robotic hysterectomy, vaginal hysterectomy, and hysteroscopic morcellation. Hysterectomy is the commonly recommended procedure by doctors to women who have large fibroid size and have completed their fertility. According to the American Congress of Obstetricians and Gynecologists, every year nearly 600,000 hysterectomy procedures are performed. However, the segment is expected to register sluggish growth owing to the injury to healthy tissue and risk of having benign neoplasms after a hysterectomy procedure. The demand for radiofrequency ablation, on the other hand, is likely to increase at a significant pace over the coming years. The increasing demand for minimally invasive procedures is one of the primary factors contributing to the growth of the segment. The fast recovery associated with this procedure coupled with the low complications and risk factor is translating into the greater adoption of this procedure. The segment is estimated to exhibit a CAGR of 7.4% during the forecast period. 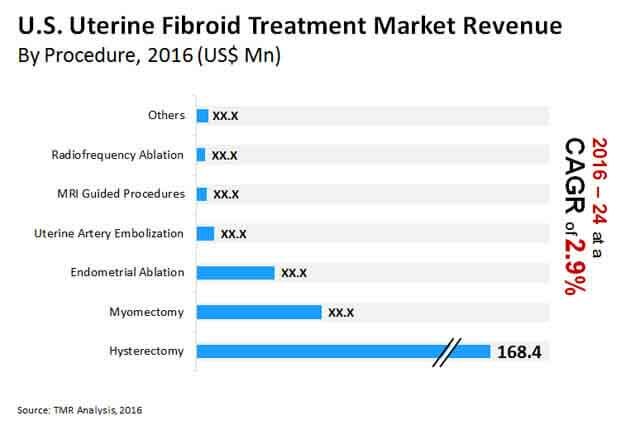 On the basis of end user, the U.S. uterine fibroids treatment market is divided into hospitals and ambulatory surgical centers. The demand for uterine fibroids treatment is higher in hospitals, owing to the fact that they are highly developed to handle complicated matters and emergencies related to uterine fibroids. Large hospitals are increasingly focusing towards training interventional radiologists and gynecologists for application of radiofrequency ablation and robotic minimally invasive procedure, which is likely to provide a significant boost to the growth of the segment. Owing to these factors, the segment is expected to post a CAGR of 3.1% during the forecast period. The ambulatory surgical centers segment is anticipated to rise at a sluggish pace during the same period, owing to the high cost of procedures in these centers along with the lack of favorable reimbursement scenario. Some of the prominent players in the U.S. uterine fibroids market are Richard Wolf Medical Instruments, Blue Endo, Halt Medical Inc., LiNA Medical USA, Cooper Surgical, Merit Medical Systems, Karl Storz, Olympus Corporation, Richard Wolf GmbH, and Boston Scientific Corporation. The uterine fibroid treatment market is driven by growing number of hysterectomy surgeries every year in the country. Furthermore, the rising coverage of healthcare and increasing prevalence of non-cancerous tumors in women of childbearing age is expected to be the most vital reason for expansion of the uterine fibroids market growth. Now a days, fibroids are an important public health concern, due of the large number of women affected by the problem and the large number of hysterectomy procedure are done to treat the symptoms. The National Institute of Health (NIH) conducts research on uterine fibroids, supports studies of fibroids at academic institutions, and sponsors interdisciplinary conferences where researchers share and discuss the results of their studies. Medical therapy is used for many women who have symptoms from fibroids and sometimes is used prior to surgery to shrink the fibroids. Commercially available drugs that shrink fibroids include gonadotropin-releasing hormones, which usually cause symptoms of menopause. Drugs that block the hormone progesterone can slow or stop the growth of fibroids. Some health care providers may use hormonal or over-the-counter medications to control pain and bleeding. According to the U.S. Department of Health and Human Services Office on Women’s Health, about 30 percent of all women will get them by age 35, and around 20-80 percent of women will do so by age 50. For some reason, African American women are more likely to experience fibroids, and to do so at a younger age. As women age, fibroid growth rates decline for most women, but not for African American women. Several treatment options are available now a days, which are driving the overall uterine fibroids market such as self-help techniques, drug therapy, uterine artery embolization and less invasive surgical procedures (myomectomy & hysterectomy). The report is a combination of primary and secondary research. Primary research formed the bulk of our research efforts, with information collected from telephonic interviews and interactions via e-mail. Secondary research involved study of company websites, annual reports, press releases, stock analysis presentations, and various national and international databases. The report provides market size in terms of US$ Mn for each segment for the period from 2016 to 2024, considering the macro and micro-environmental factors. Growth rates for each segment within the U.S uterine fibroids market have been determined after a thorough analysis of past trends, demographics, future trends, technological developments, vaccination expenditure, and regulatory requirements. The market overview section of the report includes qualitative analysis of the overall uterine fibroids market including the determining factors and market dynamics such as drivers, restraints, market trends and opportunities, along with white space analysis. In addition, market attractiveness analysis by country and end-user along with competitive landscape by key players have been provided which explain the intensity of competition in the market. The competitive scenario between market players has been evaluated through market share analysis. These factors would help the market players take strategic decisions in order to strengthen their positions and increase their shares in the global market. Pricing analysis holds a crucial part of the report, which further describes the cost to end-user and cost to patient. The market is driven by changing prevalence of cancerous tumors. The market is projected to grow due to increasing investment in healthcare sector. In terms of distribution channel segment orthopedic clinics is projected to expand at a high CAGR on the backdrop of growing investment healthcare during sports injuries. The hospitals and ambulatory surgical center segment are expected to expand at a significant CAGR over the forecast period. Geographically, the U.S uterine fibroids market is showing a substantial growth due to increasing direct and indirect investments by the government and other private companies. Increasing investments and penetration by key market players globally are expected to drive the uterine fibroids market during the forecast period. Key companies profiled in the report include Blue Endo, Richard Wolf Medical Instruments, Boston Scientific Corporation, Cooper Surgical, Halt Medical, Inc., Karl Storz, LiNA Medical USA, Merit Medical Systems, Olympus Corporation, Richard Wolf GmbH and Halt Medical, Inc.